JOBS FC, JOBS H2 and JOBS NG are spreadsheet-based tools that use anticipated dollar flows within an economy to estimate economic impacts. As goods and services required to deploy fuel cells and hydrogen or natural gas infrastructure in a user-defined scenario are bought and sold, employment, earnings and economic output are produced which in turn generate additional employment, earnings and economic output. 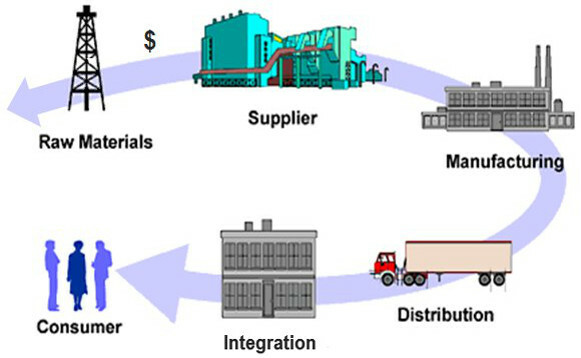 As shown in the following illustration, as fuel-cell, hydrogen or natural gas infrastructure-related production proceeds down the supply chain (clockwise, from the extraction and supply of raw and finished materials, to the manufacture and assembly of components, to the distribution and integration of finished products), expenditures flow up the chain (counterclockwise) to the respective economic sectors. Fuel-cell and fuel infrastructure-related expenditures (hydrogen or natural gas) include the purchase of the fuel-cell and fueling infrastructure, energy/fuel and expenses associated with installing and operating the fuel cell and fueling infrastructure. As these dollars flow through the economy they provide jobs and income to individuals and establishments directly involved in the provision of fuel cells and fueling infrastructure (direct jobs), to individuals and establishments further up the supply chain (indirect jobs), and to an array of service and support industries whose growth is induced by the re-spending of those dollars in the economy (induced jobs).